IDEAS IN FOOD: Why Not Sorbet? We have really enjoyed pairing ice creams with caviar. The model allows us to think of a base flavor or idea and translate it into ice cream. The ice cream flavor or spark often is driven by the caviar we are going to serve. Recently we received the Tequila and Habanero roe Steve (of Blis Caviar ) cured for us. 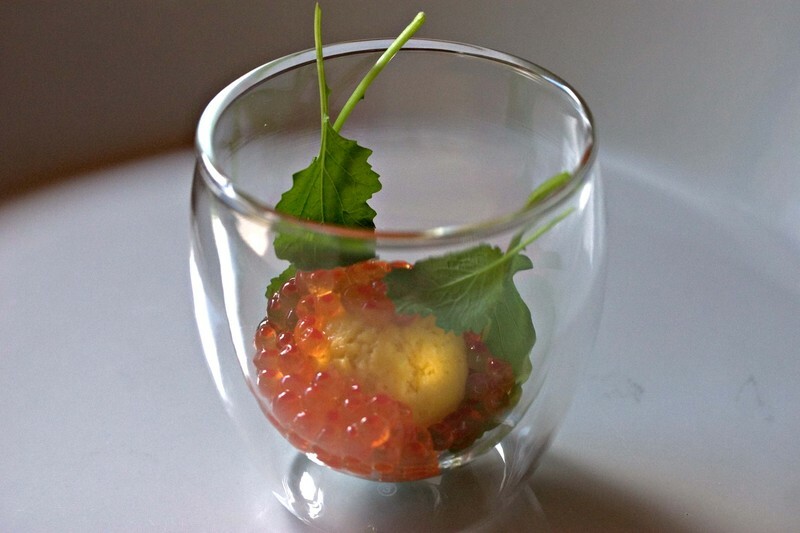 This caviar, cured steelhead trout roe, is a symphony of flavors. The roe, the creaminess, the salt, the heat, the sweet heady peppery acid of the tequila come together into what I believe is his most complex and compelling combination. The trick with this roe is what to serve it with. At first my mind bunted. I made a new batch of grilled potato ice cream using fingerling potatoes. The ice cream is rich and decadent, just not suited for being served in the summer. We were talking about an upcoming dinner and during the discussion I tasted a mango sorbet prepared by the third member of our kitchen team. The flavor screamed mango and since my mind was on roe the two united in more ways than one. I ran to the walk in and tasted the roe in conjunction with the sorbet. A match, a tasty match. We also broke through a wall with this one. Why was I strictly looking at ice cream to pair with the roe? There is a whole world of sorbets which we can now fit into our model. In fact, perhaps the model will evolve in the process. Next up is peach sorbet with the smoked steelhead trout roe and a ruby grapefruit sorbet with the sake roe. It truly is exciting when the dam breaks and the ideas flow.